The Mohawk River is a 149-mile-long (240 km) river in the U.S. state of New York. 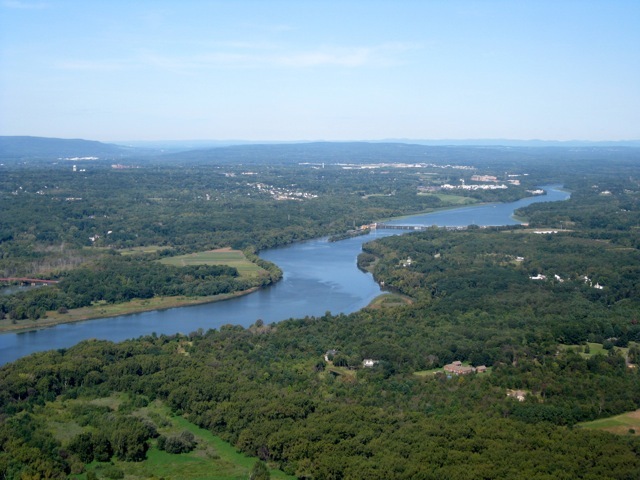 It is the largest tributary of the Hudson River. The Mohawk flows into the Hudson in the Capital District, a few miles north of the city of Albany.The river is named for the Mohawk Nation of the Iroquois Confederacy. It is a major waterway in north-central New York. 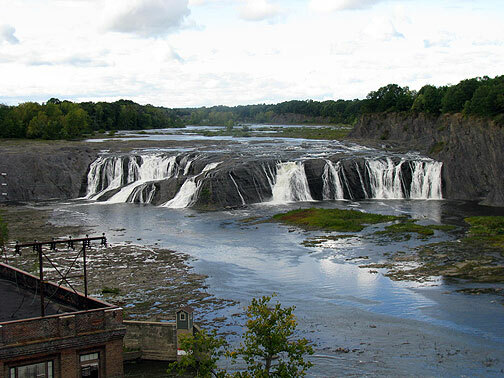 From its source in Lewis County the Mohawk River flows generally east through the Mohawk Valley, passing by the cities of Rome, Utica, Little Falls, Canajoharie, Amsterdam, and Schenectady before entering the Hudson River at Cohoes, just north of Albany. The river and its supporting canal, the Erie Canal (a part of the New York State Canal System, called the New York State Barge Canal for much of the 20th century), connect the Hudson River and port of New York with the Great Lakes at Buffalo, New York. The lower part of the Mohawk River has five permanent dams, nine movable dams (seasonal), and five active hydropower plants. Schoharie Creek and West Canada Creek are the principal tributaries of the Mohawk River. Both of these tributaries have several significant dams including the Hinckley Dam on the West Canada and the Gilboa Dam on the upper reaches of Schoharie Creek. The Gilboa Dam, which was completed in 1926 as part of the New York City water supply system, is the subject of an active and aggressive rehabilitation project. The river has long been important to transportation and migration to the west as a passage through the Appalachian Mountains, between the Catskill Mountains and Allegheny Plateau to the south and the Adirondack Mountains to the north. The Mohawk Valley allowed easier passage than going over the mountains to the north or south of the valley. As a result, it was strategically important during the French and Indian War and the American Revolutionary War, and a number of important battles were fought here. The fertile Mohawk Valley also attracted early settlers. In the early nineteenth century water transport was a vital means of transporting both people and goods. A corporation was formed to build the Erie Canal off the Mohawk River to Lake Erie. The canal cut shipping costs to Lake Erie by 95%. It also simplified and reduced the difficulties of westward settler migration. The Mohawk Valley still plays an important role in transportation. Railroads followed the Water Level Route, as did major east-west roads such as Route 5 and Interstate 90.